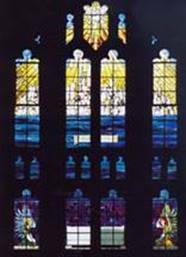 In 1918 Gresham’s headmaster George Howson announced that the newly built school Chapel would be furnished with a memorial to the students and staff who died fighting in WWI: a stained glass window designed by Reginald Otto Bell; and the names of the fallen carved and gilded into a six-panel memorial board. 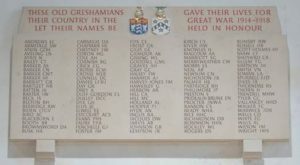 100 years later, Gresham’s has raised £8,000 for a new memorial stone, which includes the names of 15 students and staff who were omitted from the original memorial. Simon Kinder, Gresham’s Head of History who has been involved in the project, explains: “The names were omitted either as a result of having only been discovered more recently, thanks to further research, or as a result of the students and staff members having moved away to other schools and institutions and therefore being included on memorials elsewhere. Some of the missing names were initially discovered by our former Deputy Head, Sue Smart, who published a poignant book about the fallen – When Heroes Die – in 2001. The book, which was reprinted in 2014, gives our school a connection with our past that few other schools are likely to have, and for that we are incredibly grateful to Sue. The combination of staff and student efforts has resulted in the school discovering 15 names – the original memorial board depicted 99 students and one member of staff and the school now knows the names of 112 students and three members of staff – which will be included on the new memorial board. The largest donation towards the £8,000 needed for the new stone was given by the Gresham’s Foundation, with further support received from the Old Greshamiam Club and wider school community. A special effort was made by former Director of Music at Gresham’s, Angela Dugdale, for organising a WWI concert, 1914-1918 Never Such Innocence, Gresham’s at War in words and music. Proceeds from the concert, alongside £10 sales of a CD recorded in the school’s Fishmongers’ Recital Room by Robert FitzGerald, with tenor Christopher Barnes and pianoforte Philip Adam titled We do not forget, were donated to the memorial stone fund. Gresham’s Headmaster, Douglas Robb, said: “In a service held to commemorate the 100th anniversary of the opening of the Chapel, in 2016, we remembered that the building stands as a memorial to those from the school community whose lives began here but were tragically cut short by war. The Roll of Honour of the 115 fallen students and staff was read out and, for each name, a member of the school’s current Combined Cadet Force solemnly left the building. The empty seats portrayed a haunting image to those present. As part of our four year focus on the centenary, we have paused and remembered each one of our fallen, as close as we can to the centenary of their death, with specially commissioned paper lanterns lit as a symbol of Hope and Peace, and 115 stories told since the project began in 2014.